If there’s a “vaporware” rock star in the custom motorcycle design scene, it’s Mehmet Doruk Erdem, a Turkish industrial designer whose computer-generated motorcycle studies spread quickly on the internet. His sketches are so convincing it’s sometimes difficult to tell if they’re “real” or just pixels. That’s generally where they remain – as ideas – but his “BMW Alpha” concept became reality via a Bonneville Salt Flats regular named Mark Atkinson, who is not a vaporware guy. He’s a dedicated professional machinist and motorcycle builder in Utah, the sort of gent who can take a big chunk of raw aluminum and create a running motor out of it during the off-season of dry lakes record-breaking. It’s the dry lake scene that binds Erdem and Atkinson, but in a very roundabout way. 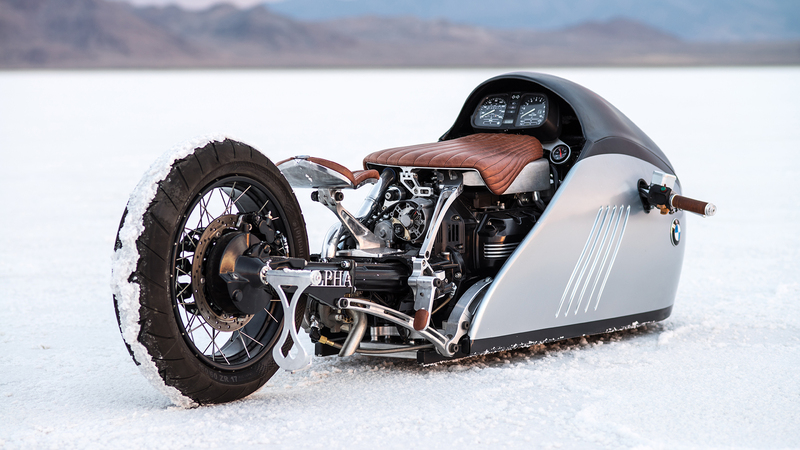 Erdem was inspired to design a motorcycle after seeing Custom Revolution’s “Asymmetric Aero,” as built by Turkish-American industrial designer Alp Sungurtekin. What began as a study of Alp’s racer became a deeper inquiry into Salt Flat racers, and, he started sketching his own ideas for his own bike, the “BMW Alpha.” Great white sharks provided inspiration for Alpha’s nose, and Erdem mixed that super-streamlined nose (and BMW kidney grille) with a rough tail section suggesting raw power. Erdem explains, “The rider must be the connection between beauty [the nose] and the beast [the tail].” The finished computer model of the Alpha was a very successful design, both aesthetically and in the attention it garnered. “BMW Alpha” has been featured on Bike EXIF.